With Mayor Ed Lee inaugurated to his first full term, Streetsblog is asking leading advocates and experts to lay out their ideas for how the mayor can move San Francisco’s transportation policy forward. We continue our series with today’s installment from Elizabeth Stampe, executive director of Walk San Francisco. At Walk San Francisco’s big member bash last month, Mayor Ed Lee celebrated San Francisco becoming the first big city in the state to take swift action to make neighborhoods safer for kids to walk to school by implementing 15 mile per hour zones at 60 schools out of 180 to come. The mayor set a bold vision for San Francisco, and an “out of the box” approach may be just what we need to reach it. But to stand by his commitment, Mayor Lee must provide the leadership our city needs to make smart, immediate investments to improve pedestrian safety in 2012. Over half of the city’s serious and fatal pedestrian crashes occur on just 7 percent of the city’s streets, according to the Mayor’s Pedestrian Safety Task Force, which started work last year on former Mayor Gavin Newsom’s December 2010 Executive Directive on Pedestrian Safety [PDF]. That finding can provide critical guidance for the city to effectively direct its resources — from traffic enforcement to street redesigns — to save the most lives. Streets that are safer and more pleasant to walk on, research has shown, also tend to increase home values and benefit the bottom line for local businesses and city coffers. We have the funds available to invest in safer streets. San Francisco voters in 2010 approved Prop AA, a vehicle license fee that helps fund pedestrian safety improvements, as well as last fall’s Prop B, which provides $50 million in bonds for both walking and biking. Create a Pedestrian Action Plan to fix 10 miles of streets per year. New York City has committed to improving pedestrian safety on 60 miles of streets per year, and San Francisco can set similar goals. The Better Streets Plan was a good start, but it lacked any commitment by the city to implement it. How much will the city do, and how soon? What can city agencies do to reduce the costs and time it takes to calm motor traffic and widen sidewalks?If Mayor Lee is serious about pedestrian safety, he will set clear goals for delivering the better streets our city has been promised for so long. Pilot low-cost projects to fix the worst streets. It’s time for a new approach to fixing our most dangerous streets with the haste we need. Mayor Lee can support low-cost pilot projects to make quick and visible changes by scaling up the parklet-and-plaza approach — let’s see what happens if we paint SoMa’s high-speed arterials to look less like freeways, install a parklet along an entire block, and put planters on street corners to make crossings safer. This week’s pilot project to reappropriate car parking lanes for pedestrian space on Stockton Street in Chinatown during the Chinese New Year is an excellent example of a way to support the local economy and improve the pedestrian experience. Enforce the laws that keep people safe. San Francisco police are now systematically enforcing the new 15 mph speed limits around schools, but we need to expand this strategy citywide to target the most dangerous behaviors like speeding and red-light running. Mayor Lee must work with the Police Chief Suhr and District Attorney Gascón to make it clear to the public that endangering others will not be tolerated. Make Sunday Streets a part of the city landscape. Sunday Streets is a proven success, and it shouldn’t just be a pilot anymore. It’s more than a street fair, more than an event — it transforms car-dominated streets into public space and provides health benefits that outweigh the costs of running the program. Mayor Lee can show his pride in Sunday Streets by making it a permanent and regular part of the city landscape that residents can rely on. San Franciscans should be able to know that on Sundays throughout spring, summer, and fall, they won’t have to worry about cars on streets like 24th in the Mission, Grant in Chinatown and North Beach, or the Great Highway along Ocean Beach. Use the America’s Cup “People’s Plan” to make the streets work better for people. This is the year to show the world that San Francisco has smart alternatives to snarled traffic. Let’s put up wayfinding signs showing how long it will take to walk to the water. Let’s finally really get rid of the Embarcadero Freeway by providing more room for people to enjoy the waterfront on foot or by bike. Let’s expedite transformative projects like the Fisherman’s Wharf Public Realm Plan and reserve some streets exclusively for walking — who knows, we might like it so much, we’ll never go back. 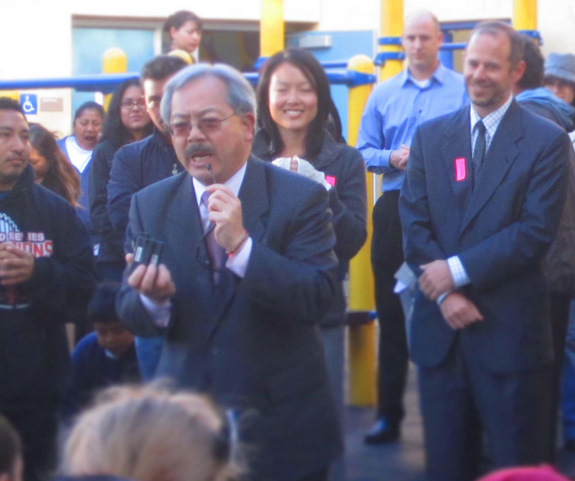 Mayor Lee knows that improving streets can make the city thrive. Getting Prop B passed was a great start; now it’s time to walk the walk and use it wisely. Good point about wayfinding signs for the America’s Cup. From the Ferry Building/Embarcadero Bart Station to the race start/finish line at Pier 29 is 9/10ths of a mile–a pleasant 18 minute walk, 5 minute bike ride or 9 minute Muni ride. (From Caltrain to Pier 29 is 14 minutes by bike on a very flat route.) There should be lots of advertising to everyone in the Bay area that all parking within a mile of the waterfront will be *very* expensive. People need to get the message that BART, ferry or Caltrain are the way to go, but this will not happen unless the city of San Francisco makes it a priority. What a great, detailed plan. We were lucky enough to be at Walk SF’s member party, and it was definitely inspiring to see Mayor Lee so engaged on these issues.